Consumer-discretionary stocks fell 0.4 percent for the worst performance among the 10 main S&P 500 industries. U.S. stocks fell after a four-day stretch of gains as analysts cut their recommendations on retailers before data tomorrow that may show a contraction in economic growth. Dollar General Corp. and Lowe’s Companies Inc. slipped more than 2 percent. Allergan Inc. dropped 4.4 percent as Valeant Pharmaceuticals International Inc. raised its unsolicited offer to about $49.4 billion. Toll Brothers Inc., the largest U.S. luxury-home builder, gained 1.9 percent after reporting that profit that more than doubled. Twitter Inc. added 4.2 percent after Nomura Holdings Inc. raised its rating on the shares. The Standard & Poor’s 500 Index slipped 0.2 percent to 1,908.08 at 10:44 a.m. in New York. 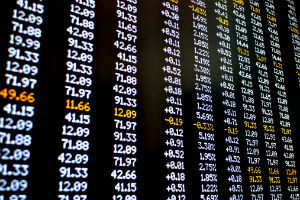 The Dow Jones Industrial Average retreated 45.18 points, or 0.3 percent, to 16,630.32. The Nasdaq Composite Index lost 0.4 percent and the Russell 2000 Index sank 0.7 percent. A report by the Commerce Department tomorrow may show the U.S. economy contracted 0.5 percent in the first quarter, following a preliminary estimate of 0.1 percent annualized growth, according to economists surveyed by Bloomberg News. GDP rose at a 2.6 percent annualized pace in the previous period. Economists forecast growth of 3.5 percent during the second quarter. The S&P 500 climbed for a fourth day yesterday after durable-goods orders unexpectedly rose and JBS SA offered to buy Hillshire Brands Co. for $6.4 billion. The equities gauge is trading at 16.2 times the projected earnings of its members, compared with a five-year average of 14.3 times, according to data compiled by Bloomberg News. Consumer-discretionary stocks fell 0.4 percent for the worst performance among the 10 main S&P 500 industries. Dollar General, an owner of discount stores, declined 3.3 percent to $54.46 as Deutsche Bank AG lowered the stock’s rating to hold from buy. Lowe’s fell 2.2 percent to $46.72. Can accord Genuity Corp. analysts told clients to sell shares of the home improvement retailer. An S&P index of homebuilders advanced 0.8 percent as all its 11 members rose. Toll Brothers climbed 1.9 percent to $36.32. The home builder has continued raising prices and boosting sales in the costlier New York and California markets. Allergan, the maker of the Botox anti-wrinkle drug, dropped 4.4 percent to $157.83. Valeant added more cash to the bid in an effort to win backing from the target and its investors. As part of its defense, Allergan yesterday criticized Valeant’s management practices and operations, saying it believes the Canadian company’s organic sales growth is overstated. Twitter added 4.2 percent to $31.77. Nomura raised its rating on the shares to buy from neutral. The operator of the social-networking site has tumbled 50 percent this year amid a rout in technology stocks. 3D Systems Corp. declined 8.8 percent to $51.67 after saying it will sell 5.95 million new shares for $317 million. The maker of printers that create three-dimensional objects will use the proceeds to fund acquisitions and as working capital. Stryker climbed 2 percent to $81.97 after a Financial Times report that the company is preparing a takeover offer for Smith & Nephew Plc. The seller of orthopedic devices has retained investment bankers and is working on putting together financing for a takeover offer, the Financial Times reported, citing people familiar with the matter. Stryker said in a statement that it doesn’t intend to make an offer for Smith & Nephew. –With assistance from Namitha Jagadeesh in London.